their users (from the web, within their apps, or other sources), and turn that information into a tailored experience. At Localytics, we wanted to help marketers with this challenging task. 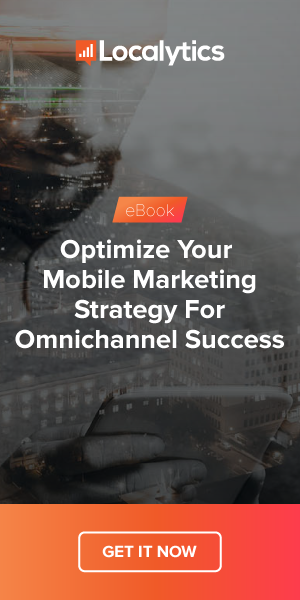 To do so, we realized we needed to make it easier for marketers to create mobile campaigns that are integrated with the rest of the user experience. Today we’re excited to announce our new campaign builder! It has been entirely redesigned with the needs of our customers and the future of the Localytics platform in mind. Our campaign builder is the first step in making it much easier to create dynamic, multi-step campaigns that are tailored to each end user. Now, real-time data about your users on mobile can be acted on right away to create super targeted campaigns that deliver a truly personalized experience with your app. Until now, it hasn’t been easy to coordinate and chain together multiple messages in Localytics. Some of our customers turned to detailed spreadsheets and documentation in order to work around this. In the new campaign builder, you don’t need any complicated processes to develop dynamic multi-step campaigns. Once you’ve set an entry event, which enrolls users who take a specific action, you can use the new builder’s graphical interface to add in the event triggers, delays, and push messages that will make up your campaign. We also needed to solve a challenge we’ve heard from a lot of our customers: the ability to send messages to multiple apps at once. To address this, we’ve introduced App Groups. With App Groups, you can bundle multiple apps together and then use the new builder to create one campaign that works across all the apps in the Group. Once you have created an App Group, you can use the new event mapping tool so that the same events are recognized across your apps. It is now possible to trigger campaigns or messages based on events, no matter where they occur—they could be happening on iOS, Android, the web, or even in your stores. As part of our beta, we’ve received a lot of feedback and great ideas for campaigns from our customers. One of our customers, a national retail chain, has seen impressive results with their abandoned cart campaigns. In just one month, open rates on their messages have increased from 1.9% to 4.16%. It’s clear that their push messages are reaching users at the right time and making a real impact on engagement. As users first install and interact with your app, you can start sending messages that encourage them to try out features that will lead them to be more deeply engaged. For example, try building a campaign that gets users to create an account or log in to your app so that you can better tailor the messages they receive and they can have a better experience. For apps with a subscription model, it’s important to ensure users see the value of your free app before you ask them to upgrade. The campaign builder will let you target users that are getting value out of the free version, which makes them more likely to convert to a paid subscription. Use your upsell campaign to drive adoption, highlight paid features, and present users with a trial offer. As the market changes, our customers continue to adapt to new buyer behaviors and expectations. We’re going to continue to support your work by creating tools that are easy to use and help you to deliver the most effective, tailored app experiences. The new campaign builder is currently completing its beta and we are planning to release it in July. Keep an eye out for an announcement in your Localytics Dashboard when it has been added to your account.